Monday will be your new favorite. (SPOT.ph) A dose of wanderlust took budding restaurateur Daene Luna places, including bringing her passion project to life: Love Monday Café. 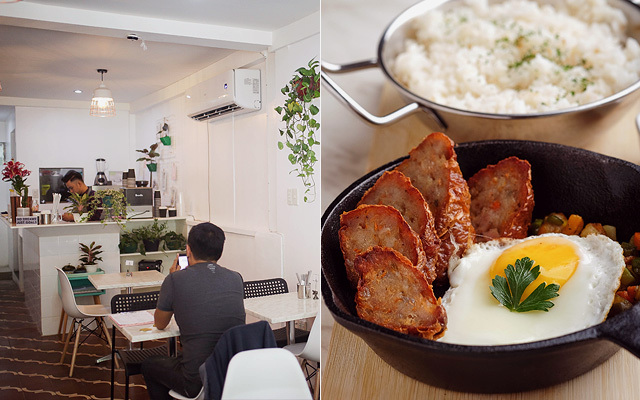 The café is in the quaint neighborhood of Kapitolyo in Pasig. Having worked in the corporate world for nine years, Daene felt it was time to pursue her one-woman labor of love. 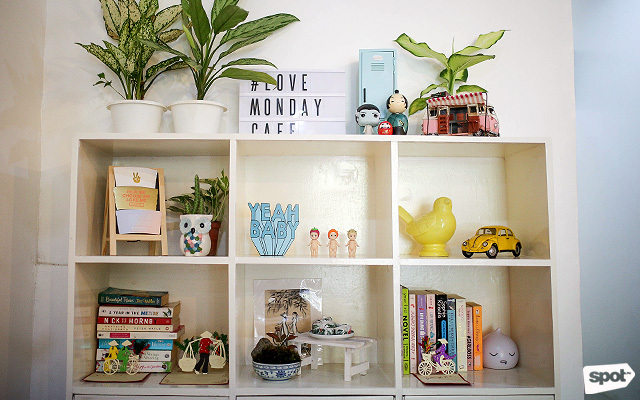 Inspired by her travels around Southeast Asia, Love Monday Café is a kaleidoscope of sentimental mementos, quirky artworks, and culinary delights. As in Vietnam, where establishments are usually set in colonial houses, her café is situated in an old shop house from way back in the ‘50s. The tiles on the floors are preserved, giving it an old-world charm. The interiors are influenced by the indie coffee shops in Seoul, particularly in the university area of Hong Dae. 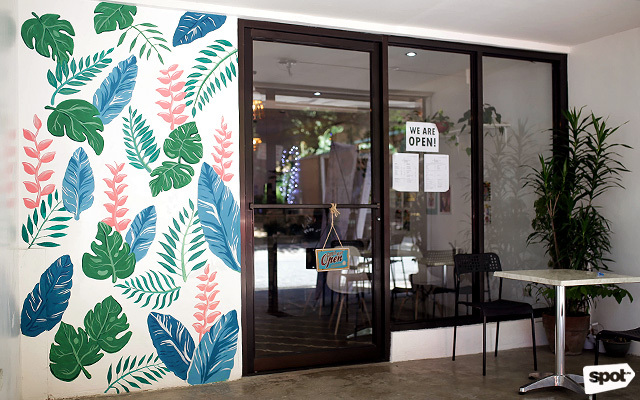 One of the cafés she went to had a Southern Californian vibe, which became her inspiration to decorate her restaurant with lots of plants and white walls depicting white sandy beaches. 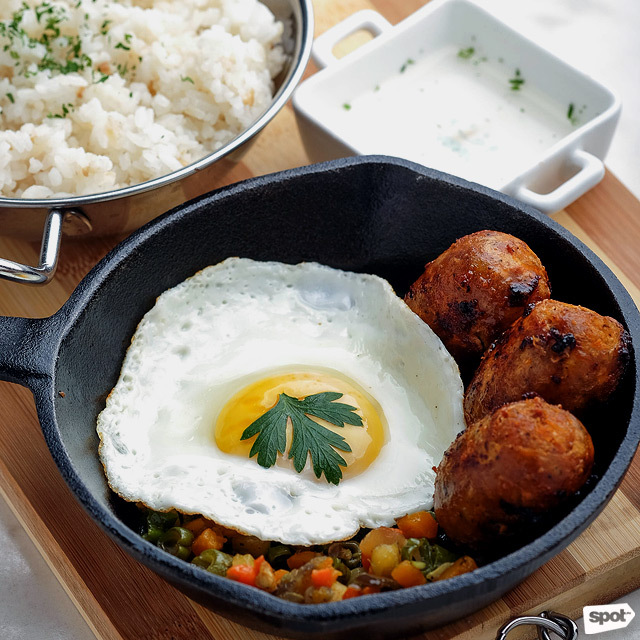 More than the fun and creative ambience, the real highlight for Love Monday Café is their smorgasbord of brunch items that are sure to give diners a #happytummy without breaking the bank. 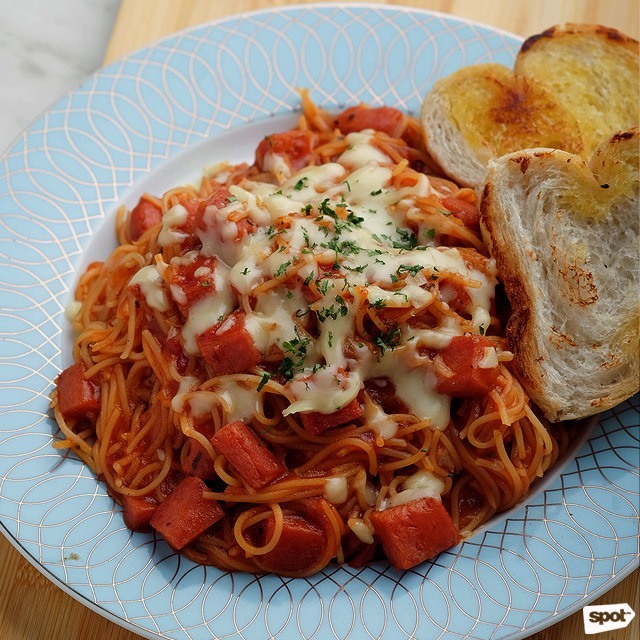 For starters, the Spamghetti (P180), named by friends who were converted Spam fans, is a sure winner for kids and the young-at-heart. It’s sweet with just the right amount of Italian spices, made more mouthwatering with chunks of Spam. Served with soft and crunchy garlic bread, the best-selling dish is topped with gooey melted cheese. The best part? The al dente-cooked angel hair pasta lets the dish burst with tasty goodness. Next on the menu is the Cheesy Rosti (P120), which are potato pancakes served in the style of crispy fritters. The rosti itself is a good reason to visit the café; a staple in Switzerland, rosti is not as easy to find in Manila. Cheese lovers will fall for this Swiss favorite, which can be paired with their choice of toppings at P60 each: poached egg, bacon, garlic Spam, garlic longganisa, and salami. 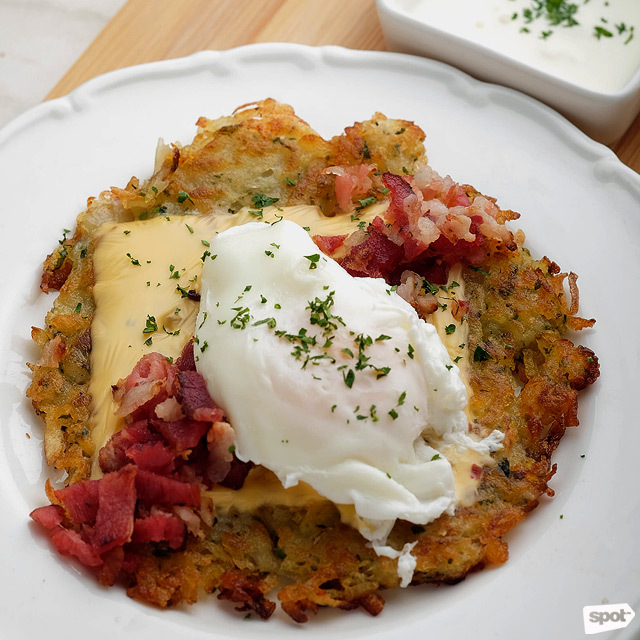 Eat it with poached egg (P15) and let the runny yolk give your rosti a chewier twist. 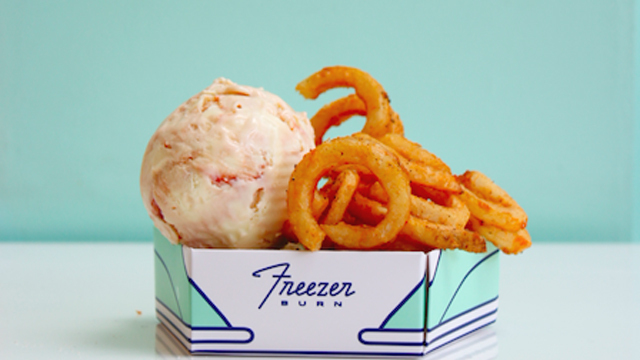 The sour cream on the side also gives it a delicate balance of sour and umami flavors. Of course, the way to a Filipino’s heart is through their stomach—with a hefty serving of garlic rice, no less. Love Monday Café has 12 selections of mains for their rice meals, all served with egg and vegetables (a yummy mix of zucchini, carrots, beans, and eggplant) sautéed in special herbs. 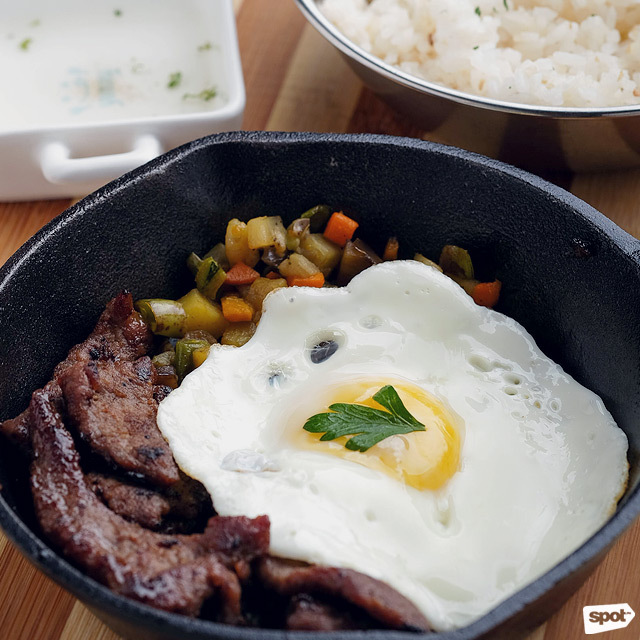 Inspired by the street food of Vietnam, the rice dishes are served in a hot iron skillet—definitely not your ordinary -silog. We recommend the Garlic Longganisa (P150), a milder version of the Vigan longganisa. 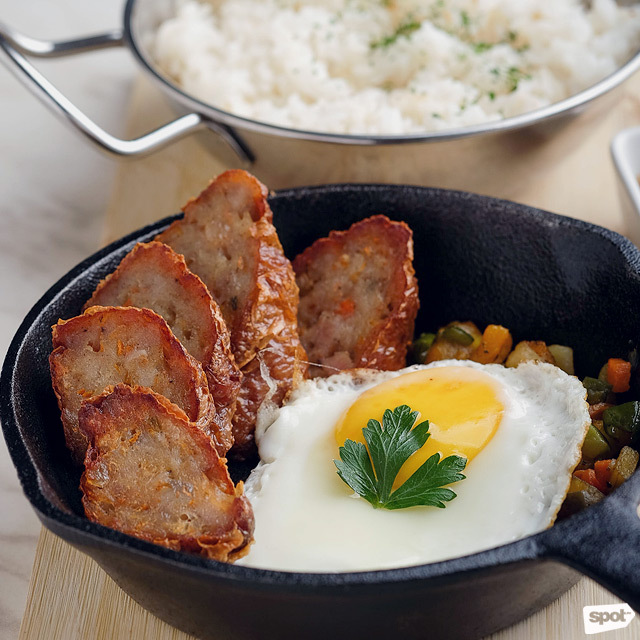 Tangy and filled with spices, the sausages are lovingly made at home by a couple from Tuguegarao. Daene believes in supporting independent suppliers to give back to the community, giving her business a meaningful human touch. Also from a local supplier, the Chinese Kikiam (P190) and the Emperor’s Tapa (P210) are both crowd-pleasers as they're fork-tender, flavorful, and filling. 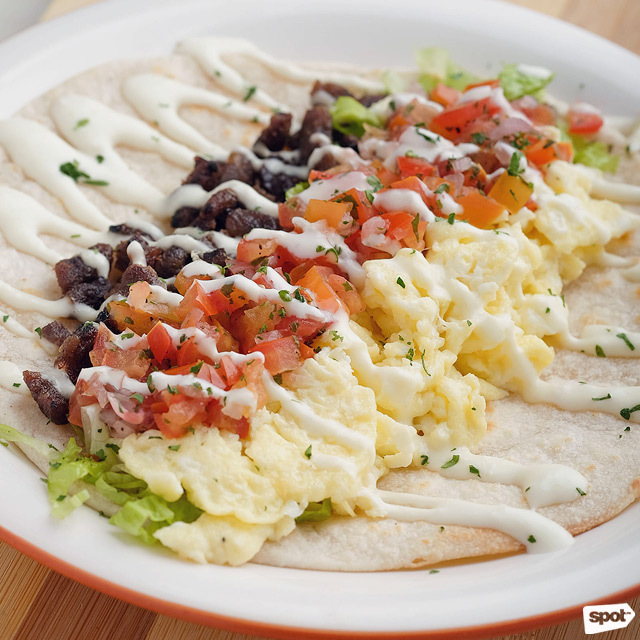 Tex-Mex food enthusiasts will love the Breakfast Taco (P180). Its tortilla is topped with irresistibly soft scrambled eggs, homemade tomato salsa, crunchy lettuce, and peppery beef tapa, with an option to replace the protein with garlic longganisa or bacon (yes, bacon!). It’s drizzled with garlic sour cream, giving it a zesty kick. 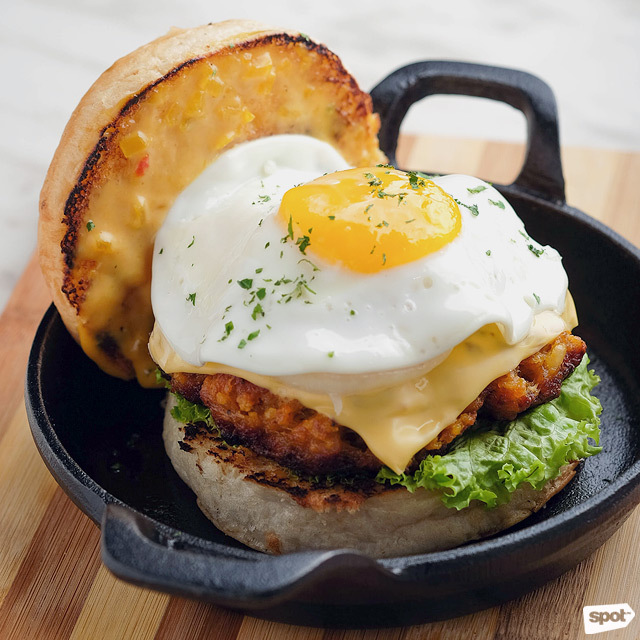 The Breakfast Burger (P180) has everything you’re looking for but with a twist: It comes with impeccably cooked fried egg and longganisa patty for a garlicky surprise. Not in the mood for burgers? 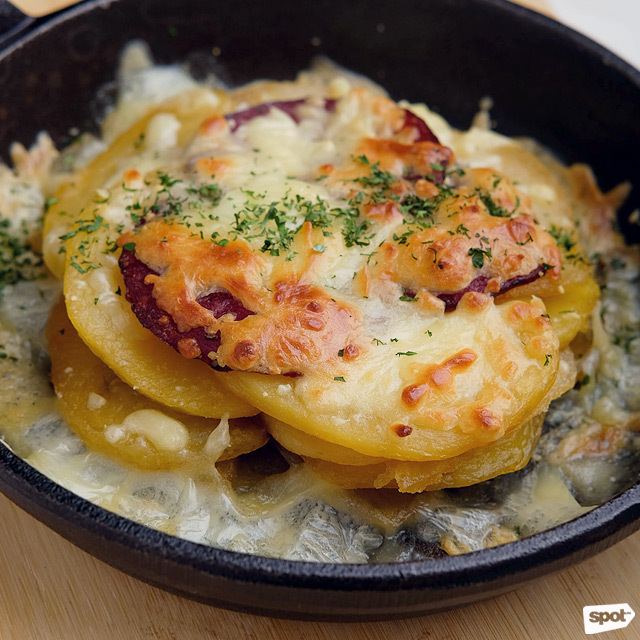 The Cheesy Salami and Potato Bake (P160) is guaranteed to tickle your taste buds with its tempting cheese and perfectly baked potatoes. The characteristic smoky taste of salami makes it a stellar item on the menu. For the ultimate steal, the Rainy Day Ramyun (Korean Ramen) (P80) is a hearty noodle soup with just the right dash of spice. 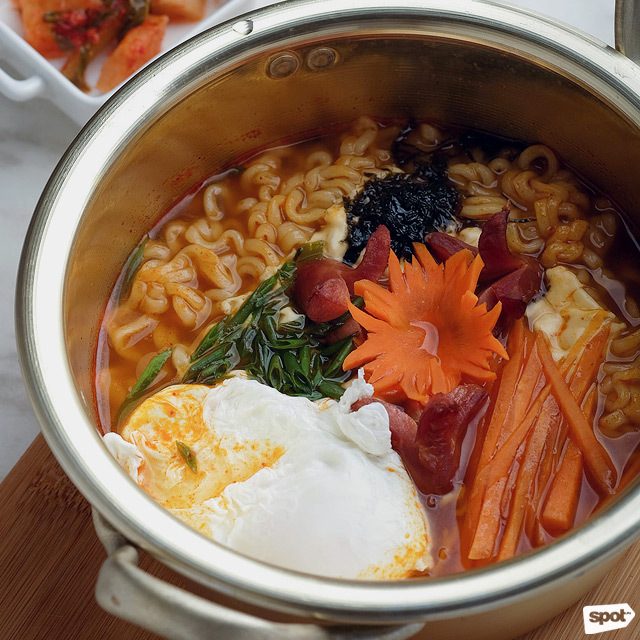 Think of it as an upgraded Korean ramen, replete with nutrition-packed nori, carrots, and spring onions served in a huge metal bowl. 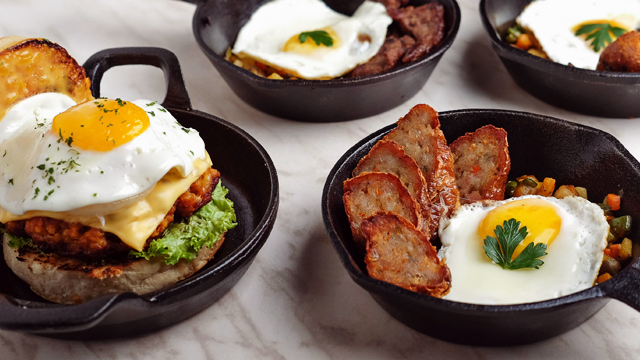 Upgrade it further with additional toppings: melted cheese (P20), savory Korean sausages (P30), garlic Spam (P30), egg (P15), and kimchi (P10). 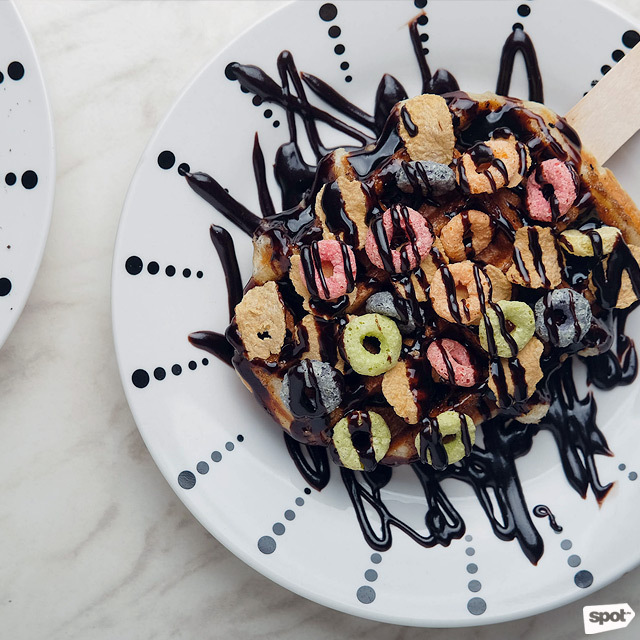 For a sweet encore, the Waffle Pops are a sure hit as it’s made from scratch, with six luscious varieties to choose from: Cookies & Cream (P50), White Choco Strawberry (P70) and the bestseller Breakfast Cereal Combo (P60), which is generously topped with Froot Loops, corn flakes, and chocolate syrup. The waffles are warm and chewy when served, and glazed with sugar for that extra boost of sweetness. Finally, a meal is not complete without Love Monday Café's collection of Instagram-worthy specialty drinks. 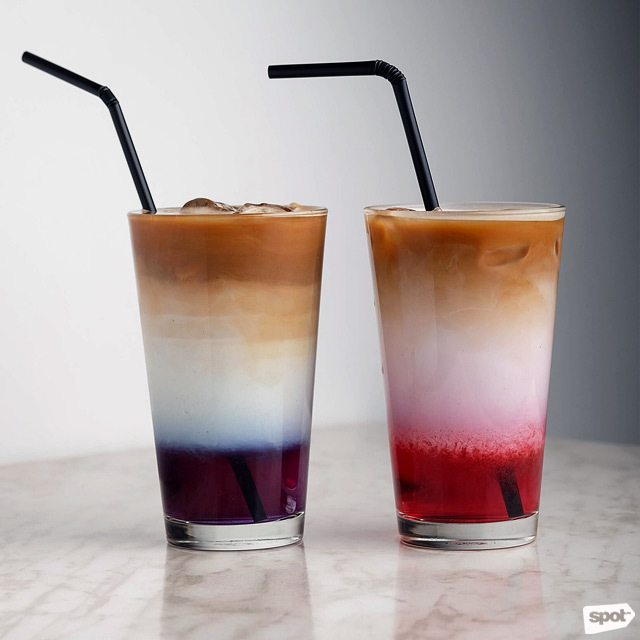 While they have the usual classic coffee mixes, adventurous coffee-philes are encouraged to try their house specials, like the three-layered Strawberry Hibiscus (P140/hot, P150/cold) or Vanilla Blue Chai (P140/hot, P150/cold). 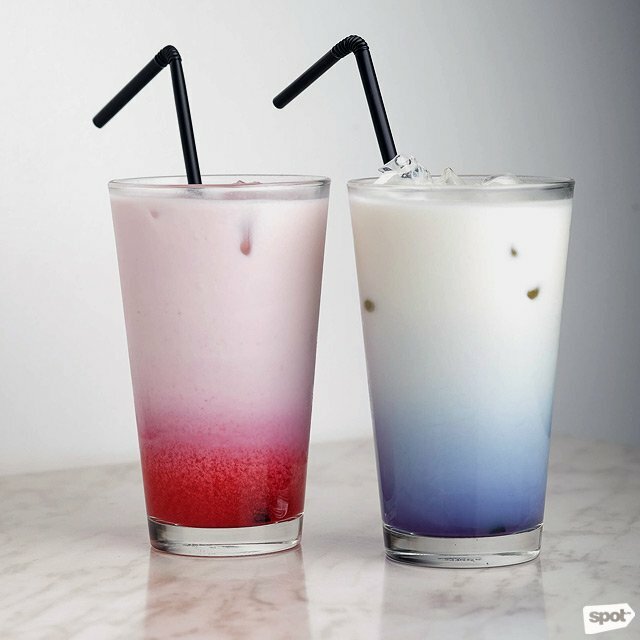 The latter contains butterfly pea flower tea commonly used in Thailand and Bali, giving it a distinctive blue color. Meanwhile, the coffee beans are imported from Indonesia and Vietnam, and the suppliers only roast the beans on the day that it is ordered, making it a truly fresh dark roast. If coffee is not your thing, try the Ombre Milk Tea (P130) version of the house specials, available in the same two flavors. No artificial colorings are used, and the tea base is all-natural and utterly earthy. The Ombre Lemonade (P80) is highly recommended for hot summer days, as it’s refreshing with just the right amount of sweetness. Choose between the Blue Butterfly or Hibiscus flavors for this rejuvenating drink. 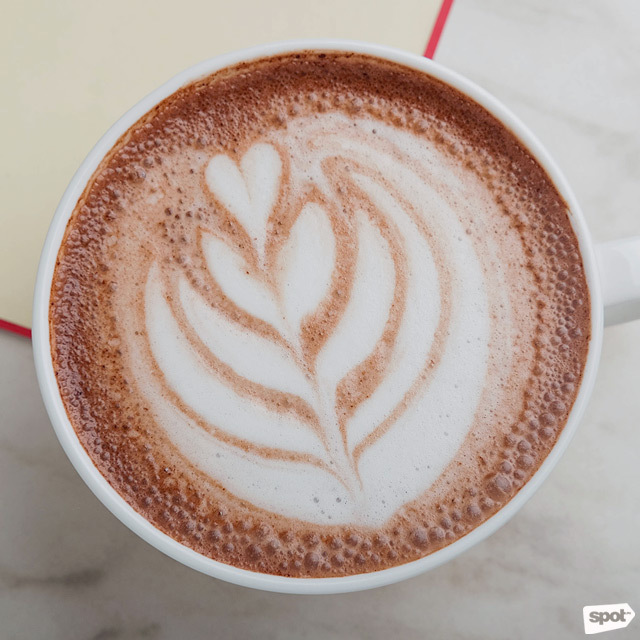 And lastly, the Hot Chocolate (P120) mixes mystery with allure with its secret recipe. The heartwarming drink has a hint of tablea from Batangas with a nutty flavor. It is not too sweet, making it a perfect companion to the Waffle Pops. 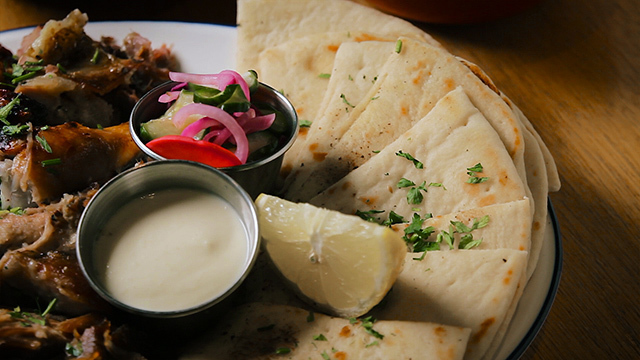 Aside from its offerings, Love Monday Café is also a feast for the eyes. Daene is an avid collector of art and a keen supporter of local talent. Her place is embellished with artworks, both from her travels and emerging artists in the Philippines. 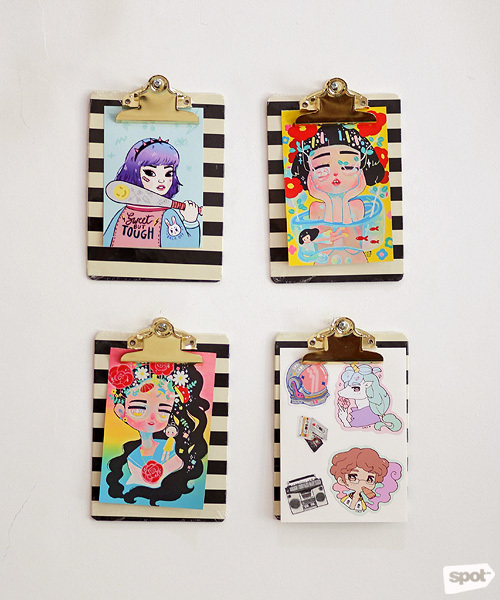 “I have Vietnamese pop-up cards, a sand painting from Myanmar, a Phoenix concert poster from Hong Kong, and the works of Filipino artist Cassy Kicks and Chichi Little,” she shares. 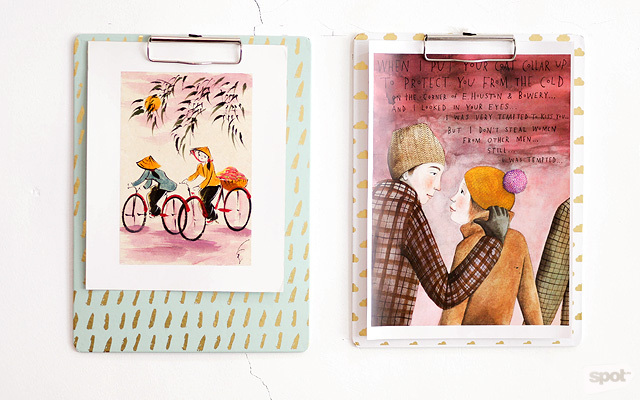 To spice things up, the upcoming Saturdays are booked with art and writing workshops and Korean quiz nights. Love Monday Café is the perfect hub for creative minds looking for eclectic food and drinks (over free Wi-Fi, of course). It’s definitely something to look forward to during the week, beating the Monday blues as they come.